Electronic charting is becoming the rule rather than the exception. A well designed bedside charting station makes healthcare information technology even more efficient and effective. Giving your hospital rooms more residential warmth can reduce patient stress and increase HCAHP scores. Reduce staff back stress by placing outlets, gases and other connections at easily accessible heights. Research shows that during a typical eight-hour shift, nurses lift a cumulative total of 3,600 pounds (1.8 tons) and 50% of nurses complain of back pain. Fight infections by selecting materials that are non-porous and have anti-microbial properties, as well as furnishings in shapes that are easy to thoroughly clean. Studies show that bacteria can double within 20 minutes on unprotected surfaces. The cost of injuries due to patient falls is expected to hit $32.4 billion by the end of the decade. Patient room floor plans, especially the bathroom location, can greatly decrease the danger of falls. When people come to healthcare settings, they bring their Internet-driven social media accounts with them. Making it easy for patients to stay connected increases social support and patient satisfaction while decreasing stress. Don’t let under foot be out of mind. Use flooring designed to help battle infection and give germs no place to hide. Effective way finding systems decrease patient and family stress and help reduce staff time spent giving directions. Using art and creativity can re-enforce your corporate brand and create positive impressions while helping reduce stress for both staff and patients. Patients aren’t the only ones who love natural light. One study showed 70% of staff said abundant natural light had a positive impact on their work lives. Use of sound-masking audio waves can reduce distractions and ensure privacy in HIPPA-sensitive settings. Obesity rates continue to rise. Make everyone feel welcome and comfortable by subtly blending pieces that accommodate obese patients in with other furniture. 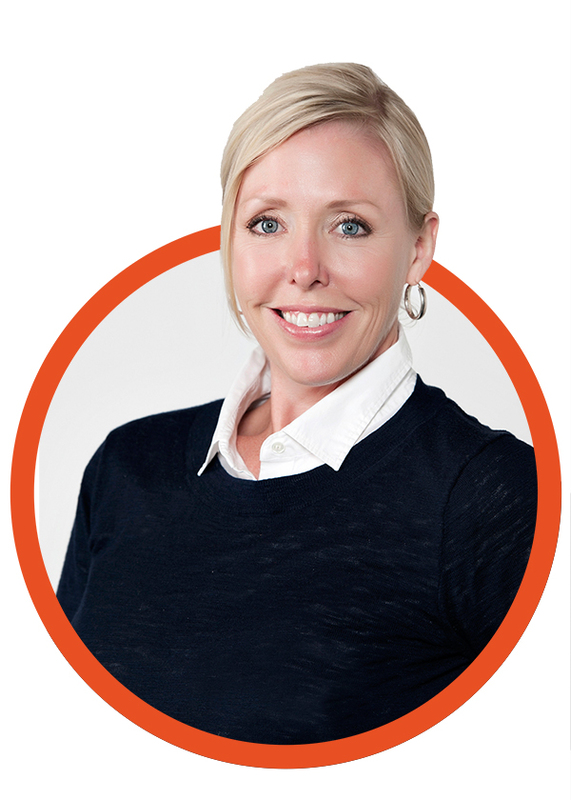 Accommodations like lowered counters make all your patients feel welcome and valued. Not all patients spend the same amount of time in your waiting areas. Design a variety of spaces for longer-term waiting that offer strong Wi-Fi connections, easy device recharging and allow quiet conversations with privacy. 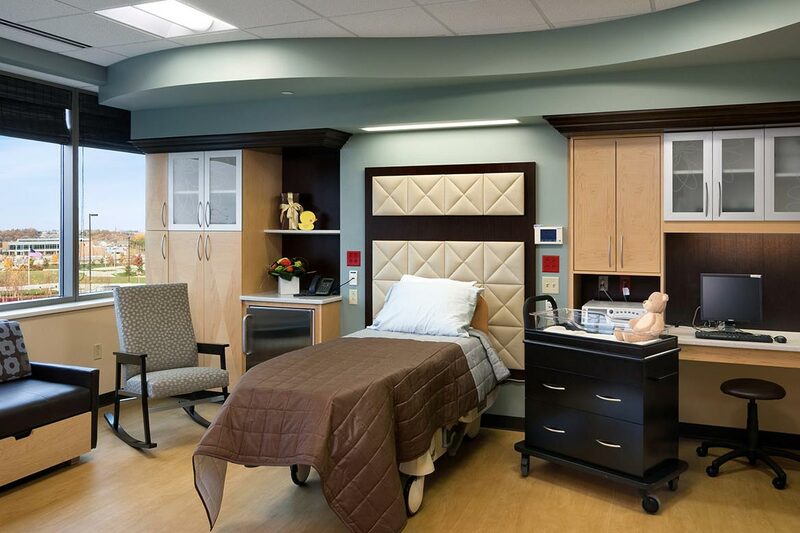 Creating an open nursing station encourages interaction between staff and patients. 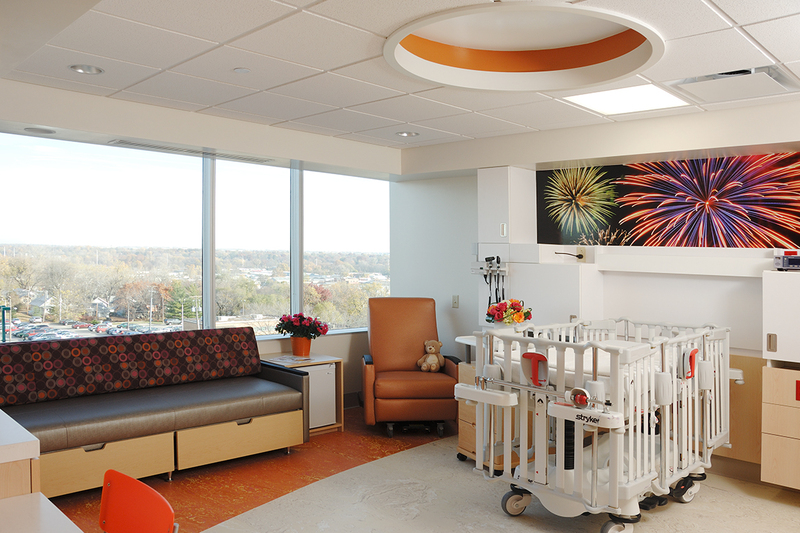 The design also allows staff a clear view to all rooms for enhanced safety and care quality. 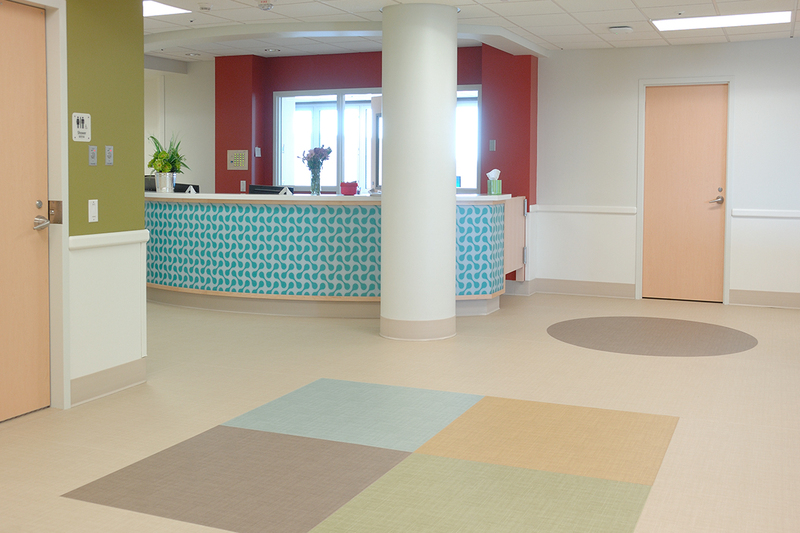 Incorporating this four square game layout into a smooth, easy-to-clean floor surface creates a more interactive environment that encourages patients to open up and feel more comfortable. These finishes give a softer feeling to the space yet are still durable, high-impact resistant and easy to clean. Make sure staff spaces have ample natural light. Access to daylight has been liked to higher job satisfaction, lower stress and fewer medication errors. 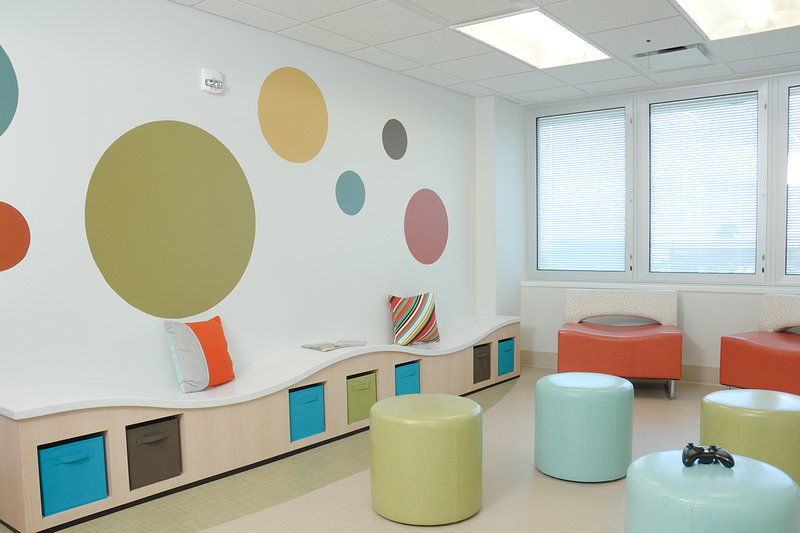 Creative paint applications make this playroom for adolescents fun while helping balance mental equilibrium, reduce behavior discord and encourage socialization. Natural lighting and access to nature can give new spaces a sense of familiarity. Natural light has been shown to decrease negative behaviors by up to 19%. 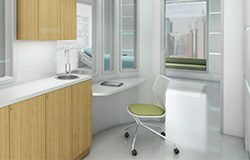 Rather than having furniture bolted down for safety, use a variety of seating options to create a more flexible environment that gives patients a sense of control and self-worth. Create a more home-like space that promotes positive behavior. Although built for a behavioral health environment, this furniture does not look institutional. The presence of friends and family can speed recovery and improve patient morale. Make sure they have enough room and feel welcomed and comfortable. 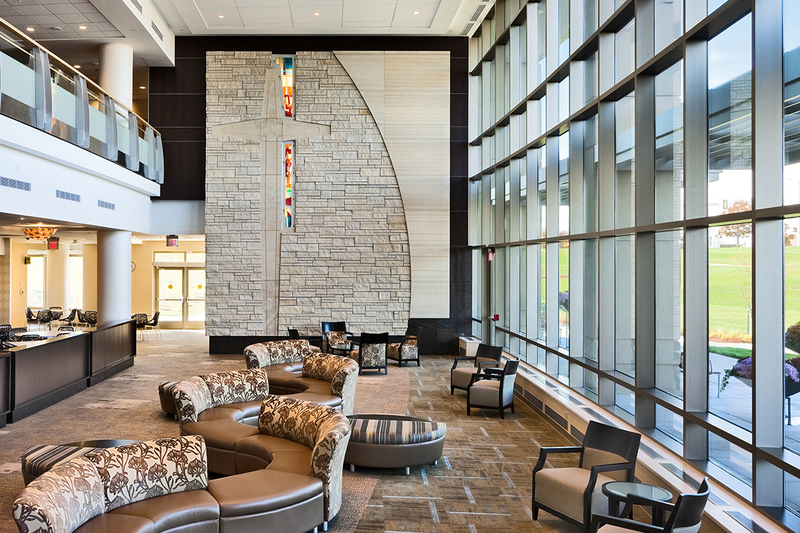 Natural light in patient and staff areas helps reduce anxiety and depression. Studies show patients in sunny rooms average shorter stays than those in gloomy rooms. Laying out all patient rooms exactly the same, known as “same handed rooms,” helps make navigation instinctive for caregivers and can reduce medication errors. Artwork provides positive distractions and stress relief for both patients and staff, as well as help reduce patients pain and staff medication errors. 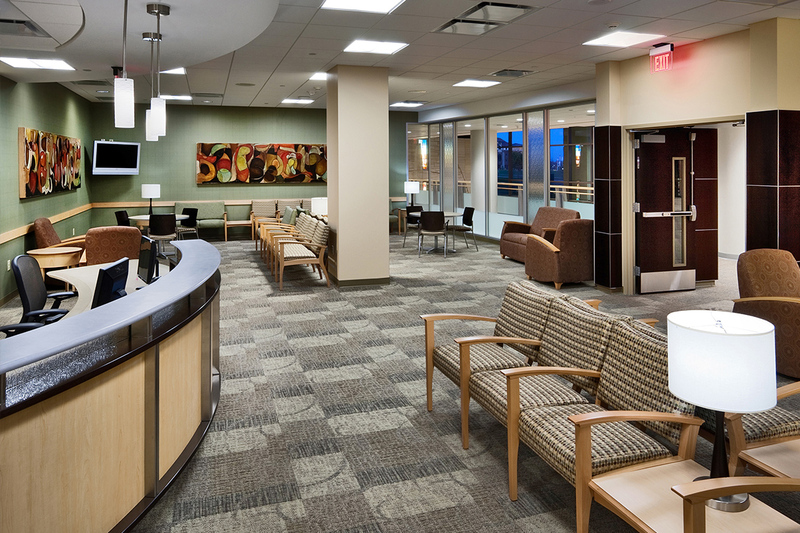 Healthcare space impacts people during times of wellness, crisis and even celebration. Smart investments can improve patient satisfaction, recovery time, cost avoidance, staff wellness, productivity and effectiveness. Respond to Regulations & Reform The Affordable Care Act is changing both how and where health care is delivered. 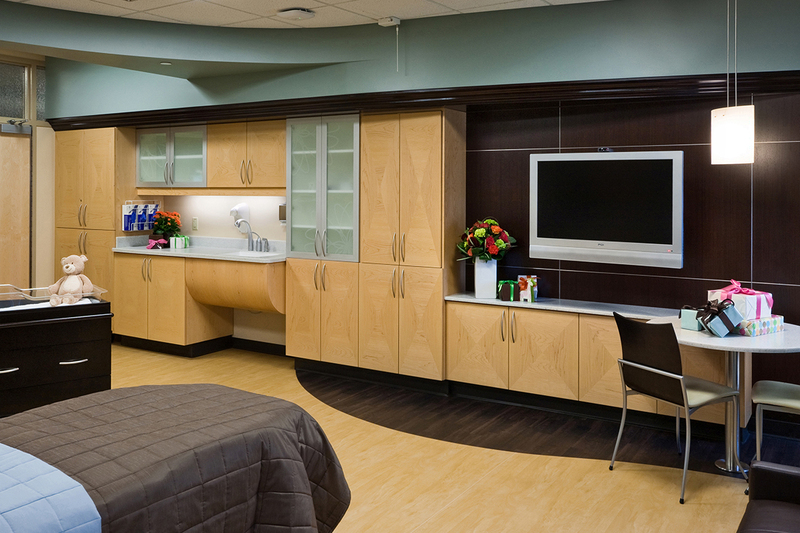 HCAHP scores are impacted by the patient experience, which is greatly influenced by how we design and furnish space. Accommodate Rapidly Changing Technology Technological advances continue to fundamentally alter how health organizations deliver care and manage health while keeping costs down. We design interiors that are agile and ready to host technology that has not yet been developed. Recognize the Shortage of Talent With a projected shortage of healthcare professionals and an increasing demand on the healthcare system, it is more important than ever to recruit and retain the best medical professionals. Space can help protect healthcare worker’s wellness, as well as increase accuracy, efficiency and effectiveness. Encourage Cost-Avoiding InnovationThe aging population and the rising cost of healthcare are spurring innovations in care delivery and cost reduction. For example, one out of every 25 patients will contract a HAI. Innovative selection of the materials patients come in contact with can help lower the incidents of HAI. Enable Proactive, Distributed Care Healthcare is shifting from the current centralized model of reactive intervention to a more proactive, wellness care model. That means care is being delivered in different locations and spaces. Those spaces need to be agile and able to host ever-changing technologies. Knoll research and HOK Healthcare partnered on a three phase design research project, resulting in a new planning concept, the "porch," that might improve important patient care and safety outcomes. This research suggests that the porch can potentially improve the patient experience and staff satisfaction.